On a calm, fall afternoon, the evening light breaks through the clouds to light up the rugged Mt. 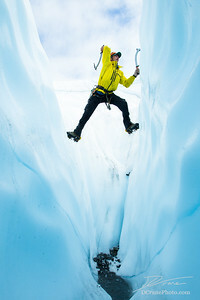 Wickersham above the icefall of the Matanuska Glacier in Alaska. 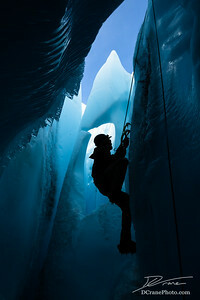 Still shaded by a large cloud, the crevasses and broken seracs of the icefall seem to take on even more blue color than usual. 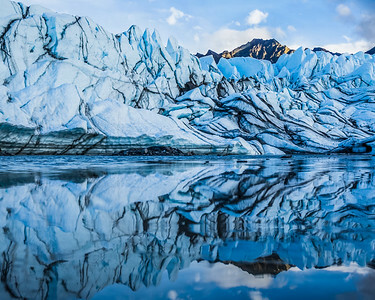 The entire scene is reflected in the shallow water of a supraglacier lake – a lake on top of the glacier – near the terminus of the Matanuska. 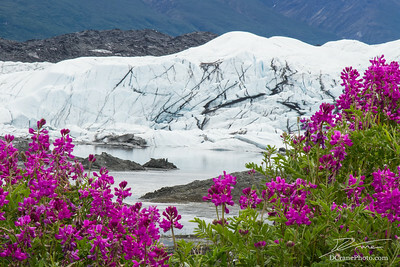 DC_20170621_008 "Evening Light on a Dark Day"
In 2017, the summer solstice saw a gloomy overcast of low clouds and dull light in the Matanuska Valley. 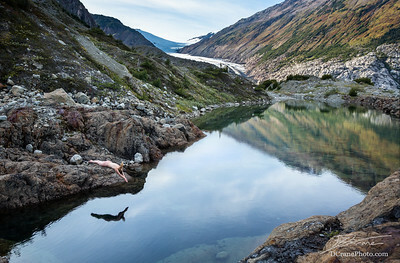 Finally, around 10pm, the clouds broke just enough to spill a narrow band of late evening sunlight across the glacier’s parking lot, slowly moving toward the ice waiting in the darkness beyond. 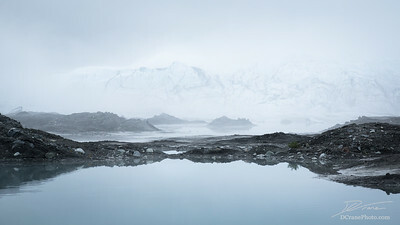 I hurried to retrieve my camera and completely guessed at what settings I might need, raising the camera to my eye just in time to snap this photo, with only seconds before the clouds had moved on and again brought darkness to the glacier. 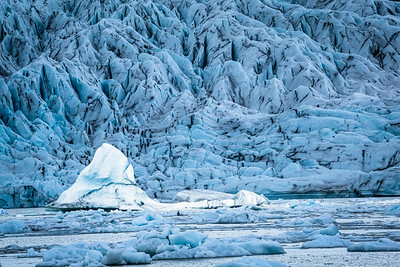 The low-key exposure and heavy contrast brings an abnormally moody feel to the Matanuska. 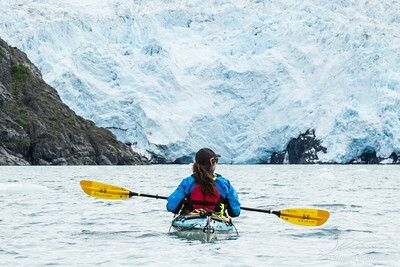 Kailey stops to soak in the view of Beloit Glacier in Blackstone Bay. 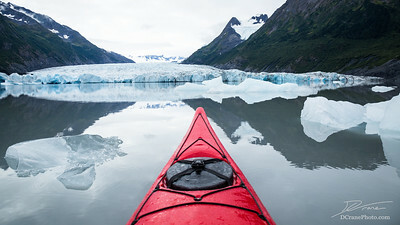 We made it to the glacier after two full days kayaking on a 3-day Exposure Alaska tour with Kailey as our guide. 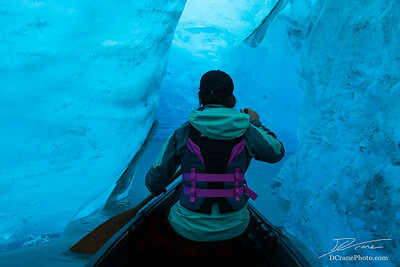 We sit in our boats, floating among many small icebergs drifting around the bay and hoping to catch a glimpse of a large calving event from a safe distance. 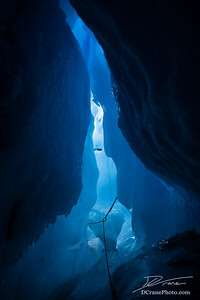 Though we see no large breaks that day, many smaller chunks of ice fall from the glacier into the ocean in front of us. 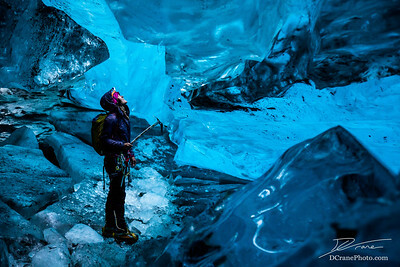 To catch the full story from our adventure, check out www.cryophotos.com/2017beloit. I set out just before sundown to hike up the Lion’s Head formation (also called Glacier Point) where I would spend a sleepless night hoping to catch a glimpse of the Auroras overhead. 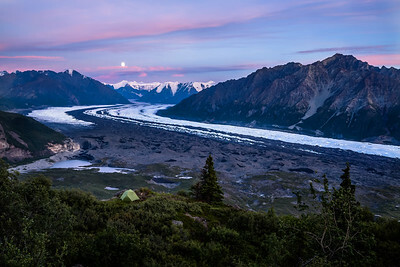 As I neared the top of the rock formation, the late summer sunset cast a pink glow on the clouds over the Matanuska Glacier and the full moon peeked out from behind the distant peaks of the Chugach Mountains. I hurried to set up the tent in time for this unexpected shot - a great consolation to the Northern Lights, which would not be seen that night. 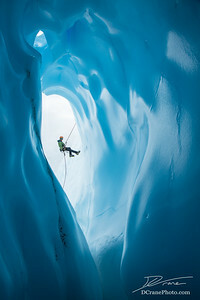 After a grueling climb of 1,250 meters in 4 kilometers (4,125 ft in 2.5 mi), the final obstacle to reach the Cascade Saddle in New Zealand’s Mount Aspiring National Park, I set up camp in the dark beneath the glow of the stars illuminating the Dart Glacier. 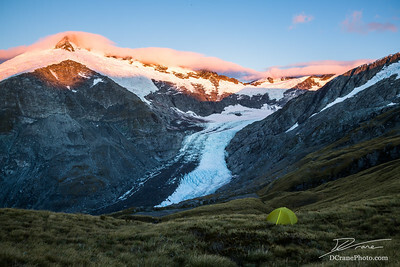 After a few hours of sleep I awoke to watch the sunrise illuminate the peaks around the glacier before breaking down camp to walk down to the ice. 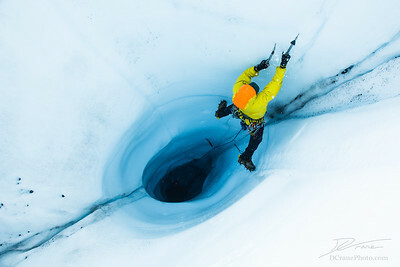 That task would prove much more difficult than planned, though, taking nearly the entire day to reach the glacier. 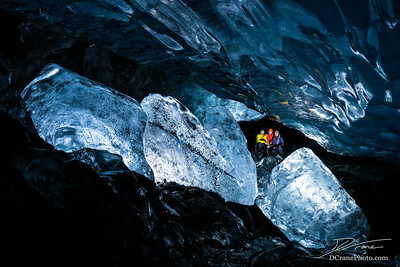 Read the rest of the story online at www.cryophotos.com/2018dart.